Before there was Mary, there were a few others that caught Crown Prince Frederik’s eye… Most often noted–of quite a few–is Katja Storkholm. 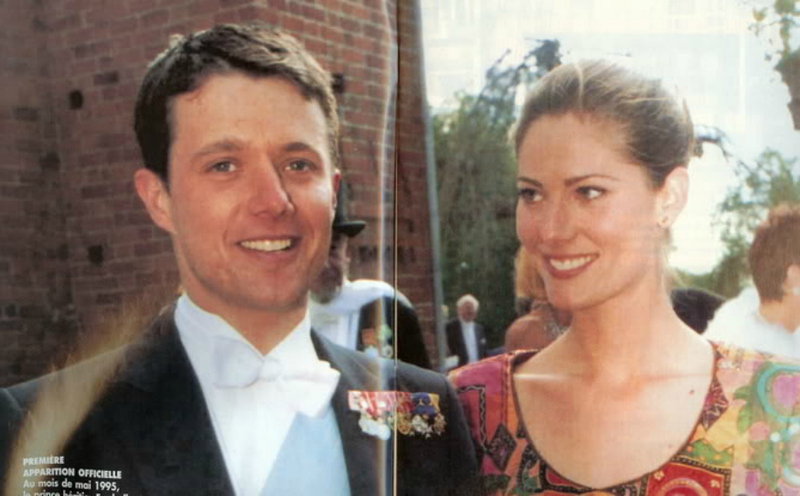 Crown Prince Frederik and Katja Storkholm began dating in his early twenties. He hit it off with the gorgeous lingerie model, and even popped the question; to which she said yes. The only problem was the fact that his mother, Queen Margrethe forbade the pairing, denying Frederik’s wishes to marry the woman who helped him through much of his military training, as well as his royal duties. It wasn’t the fact she was a lingerie model that halted the pair’s plans for marriage, rather the fact there is an unwritten rule in the Danish royal family that they marry non-Danish partners. The strong gaze. The high cheekbones. The little narrow and slightly reserved smile. Just three little details that Crown Princess Mary has in common with her predecessor, model Katja Storkholm, who is now 41 years old. And just now, when both women have reached a certain maturity and rounded the big 40, the images very clearly show that the similarity between them is striking. And perhaps with good reason. Although it is many many years ago that Frederik was dating the beautiful former lingerie model, sources close to the crown prince made no secret of that of all his now ex-girlfriends, Katja Storkholm is the one who has meant the most to him. And not only because it was her who broke off the relationship. Thus, it is reported that Frederick was actually down on his knees and proposed to Katja. Which is hardly an ill-considered gesture for a Crown Prince. According to Trine Villemann’s book ‘1015 Copenhagen K’ it was Katja Storkholm who helped Frederik find his own footing as Crown Prince and was a huge support for him. Among other things, it was her who backed him when he wanted to implement his tough training in the Frogman Corps. “It should have been those two,” she writes. But the queen seemed to be opposed to the match. And finally, the pair then went their separate ways. Katja Stockholm was subsequently married to three years younger lawyer and yachtsman Chresten Plinius at Frederiksborg Castle Chapel. Shortly after, the pretty model got pregnant and the couple had a son, Vitus. In 2009, however, the marriage ended. And Katja Storkholm has since been a single mother and lives in Østerbro along with her son. She has trained as conservator and among other things, specialises in COBRA art. “I am very diligent, but I also really prioritise my son. I’m his anchor, so that means more than work,” says Katja Storkholm in an interview with Børsen. Katja wasn’t Crown Prince Frederik’s only love, but she certainly was one of the big ones. No one enjoys hearing about their partner’s exes, so I can understand Mary’s surprise, and discontentment, when she learned of this all in the pages of a book… but such is the life of a being a royal, public figure.